The New Philadelphia Fire Department is a full-time career fire department with 15 firefighters, 3 lieutenants, 3 captains and a chief. We provide Fire and EMS protection for the city of New Philadelphia as well as Goshen Township. In addition, we provide automatic mutual aid fire protection with the York Township Volunteer Fire Department. 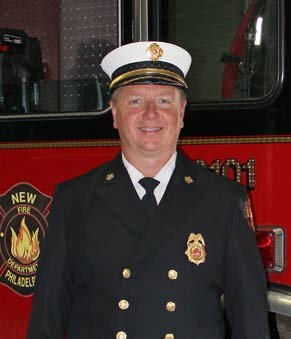 Chief Jim Parrish has served the New Philadelphia Fire Department since 1992 as a firefighter/paramedic. He was promoted to Captain in 2002 and Chief in 2008. In his role as Chief, Parrish works closely with the New Philadelphia City Council and administration as well as area Fire and EMS agencies to provide the community with the best quality and efficient Fire and EMS service possible.